On March 27, 2019 India carried out its maiden ASAT (Anti-Satellite Test) off the coast of Odisha titled Mission Shakti. India’s Defence Research and Development Organization (DRDO) developed missile successfully engaged an Indian orbiting live target satellite in Low Earth Orbit (LEO) in a ‘Hit to Kill’ mode covering a distance of 300 km to engage within 3 minutes. The target satellite is likely to be Microsat-r (2019-006A), a 740 kg Indian military satellite launched two months earlier on 24 January 2019 on PLSV-C44 from Satish Dhawan Space Centre with the test taking place near 5:40 UT. With this maiden test, India has entered the elite group of nations capable of Next Generation Space Wars making it the fourth in the club after USA, Russia and China. After the test was conducted, PM Modi addressed the nation and stated, “The new capability we have developed is not directed against anyone…India has always been opposed to the weaponisation of space and an arms race in outer space, and this test does not in any way change this position. 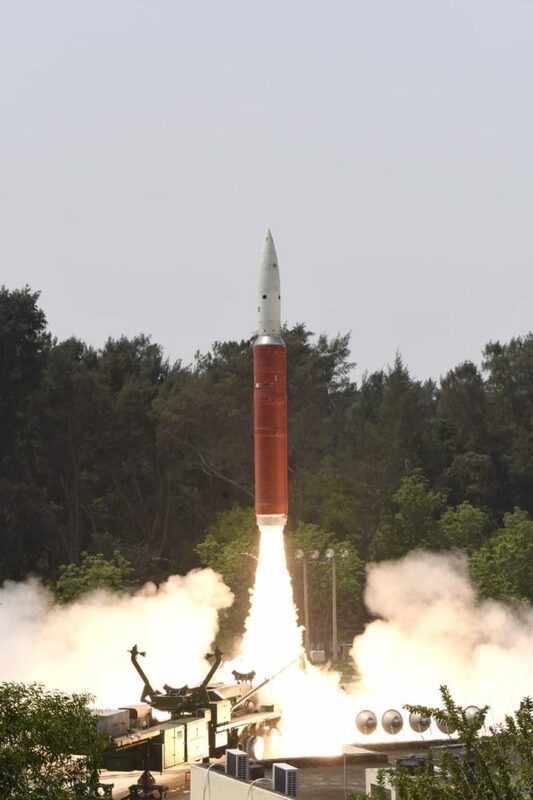 The test is critical to protect Indian interests in space that have become a critical part of our day to day lives and from the point of view of India’s security and economic development, today’s ASAT missile will give the country new strength”. DRDO Chief VK Saraswat had already spoken about the Indian capability of conducting an ASAT test in 2012 but the test was carried out only now due to the strong will and backing of the political leadership. The successful test also provides a sign of India’s Ballistic Missile Shield Defence Program loud and clear to its friends and foes. India’s ASAT test does not violate any international law or treaty and the choice of the lower atmosphere for conduction ensured no space debris as any remnants will re-enter the atmosphere and burn up within weeks unlike China’s 2007 ASAT test whose debris harmed other satellites and will take decades to clear. ASAT systems can render nuclear weapons useless by destroying the satellites that are used to identify targets, spy, plan troop movements etc. Balakot suggested a paradigm shift in India’s national security doctrine and the ASAT test is in sync with India’s changed stance from soft deterrence to hard deterrence. Incidental developments, improved target ranges and better capabilities will inevitably follow to create an effective Indian space fighting mechanism capable of offensive, counter-offensive and defensive measures that include taking down ICBM’s in space. A successful demonstration of India’s ASAT capability was mandatory to enhance the credibility of India’s nuclear deterrence in context of China and the growing Sino-Pak nexus. Thus, with space warfare becoming inevitable in the times to come as explained in our 2016 book, The New Global Order, this ASAT test is as significant if not more as Pokhran II in 1998. An Outer Space Treaty was signed in 1967 but is currently irrelevant as it focused on weapons that could be fired at the earth from space. Thus, ASAT systems find no mention in the 1967 treaty which resulted in USA, Russia and China conducting multiple ASAT tests to weaponize space on their terms. In the process, these countries have contributed to creating tremendous space debris leading to congestion in their quest of the militarization of the final frontier. As satellites are essential for civilian use: TV signals, in-flight communications, GPS, climate monitoring and military use; it is only a matter of time before more countries conduct ASAT tests. This will certainly mean the creation of a new Space Treaty where the first movers will do their utmost to frame unfair laws to ensure no new entrants are allowed entry. India was at the receiving end of this unfair treatment after Pokhran II as it conducted its test after NSG was signed whose membership eludes it to this day. This timely testing before the creation of any such regime guarantees India a place at the high table which is vital for the security and strategic interests of the world’s largest democracy. While India’s ASAT test was conducted in 2019, USA conducted its first successful test in 1959, USSR from 1963-71 and declared its system operational in 1973 while China conducted its first test in 2007 amidst total secrecy. With Russia getting weaker post USSR fall in 91 and the USA emerging as the sole superpower; USA is the current undisputed leader of space technology with its systems probably outclassing Russia and China collectively. With years of perfection and unlimited resources, USA has enjoyed an unfair advantage over its opponents in satellite technology in the Gulf Wars and current War on Terror. Its drone warfare is also courtesy its high precision satellites. USA relies on satellites for 70-80% of its intelligence gathering and 80% of its communication needs. As China’s PLA has not fought a real war in a long time and lacks battle-ready credibility and its Military-Industrial Complex is nowhere close or tested in real time unlike USA; China has chosen to adopt asymmetrical space warfare, trade deficits and propaganda against the US to gain advantage. Some of the weapons China has developed are navigation satellite jammers to disrupt GPS, laser weapons to disable US spy satellites, blinding sensitive satellite surveillance devices and preventing spy photography when over China along with direct ascent anti-satellite missiles, co-orbital anti-satellites systems, computer network operations, ground based satellite jammers and direct energy weapons. These weapons systems include a satellite armed with an explosive weapon, fragmentation device, kinetic energy weapon, laser, radio frequency weapons, jammers or robotic arms etc. Chinese ASAT capabilities now include Low, Medium and High Earth Orbit satellites. For India, China’s ASAT systems present a definite risk. China’s proliferation is an open secret and here the Sino-Pak nexus directly comes into play. China has always carried out proxy war via Pakistan and other actors while maintaining a façade of a harmonious and peace loving neighbour with India. China has helped Pakistan launch its advanced communication satellite Paksat-IR, provided expertise in satellite building and its Beidou navigation network gives Pakistan a GPS version with a military accuracy of 10cm. It is not farfetched for China to proliferate ASAT technology to Pakistan to target India. Geopolitically, we are living in very interesting times. Cold War 2.0 between USA and China is brewing. India and China are neighbours and India’s arch-enemy and neighbour Pakistan is almost a Chinese colony. Thus, in the impending Cold War, per Chanakya’s Arthashastra of your enemy’s enemy is your friend; USA and India become natural allies. This is interesting because India has historically aligned with USSR, now Russia who was USA’s counter pole in Cold War 1.0. Strength always respects strength and India’s growing international stature, diplomatic clout and goodwill has reaped handsome dividends. After Pokhran II, India was subjected to sanctions by USA; today post its maiden ASAT, India has received subtle endorsement from it and a guarded response from China. Russia’s silence and the absence of any acknowledgements or congratulations are very interesting. Even after Balakot, Russia did not acknowledge India’s actions which have undoubtedly raised a question mark furthering the Sino-Russia nexus which we will undeniably see more of in Cold War 2.0. Fully aware of space as the final frontier in Next Generation Warfare, Russia and China have been trying to push USA into the negotiation of an international treaty for years to demilitarize space which would effectively take away the advantages USA currently enjoys behind the façade of international responsibility. Russia and China have much to lose if the United States were to pursue the space weapons programs laid out in its military planning documents. Russia and China have pushed for years for a PAROS treaty (Treaty on the Prevention of Arms Race in Outer Space). PAROS calls for states, especially those with space capabilities to preserve space for peaceful uses and prevent the use of space weapons and the development of space-weapon technology and technology related to so-called missile defence. It also prevents any nation from gaining a further military advantage in outer space. USA has argued that PAROS is not the most relevant term or treaty to pursue and it seeks to “ prohibit or limit access to or use of space” and is impossible to enforce as “any object orbiting or transiting through space can be a weapon if that object is intentionally placed onto a collision course with another space object”. In 2014, the Russian and Chinese governments submitted a new version of a draft treaty on the prevention of the Placement of Weapons in Outer Space Treaty (PPWT) which said, “We consider a legally binding ban on placement of weapons in outer space as one of the most important instruments of strengthening global stability and equal and indivisible security for all”. While PPWT appears noble on the surface, its words are highly misleading. It does not address direct-ascent anti-satellite (ASAT) systems, soft-kill weapons such as lasers that could be employed to permanently or temporarily disable a satellite, breakout weapons such as direct-ascent or co-orbital weapons that could be manufactured and launched in the event of hostilities and the issue of space debris which significantly affects the functioning of outer space assets . It instead smartly focuses on the placement of weapons in outer space. PPWT draft further states that further details can be agreed upon post signing which basically means China and Russia could use their collective power to block US space activities. It is clear that China has been pursuing a space arms race and ASAT agenda behind the charade of creating a missile defence shield with Russia its active partner in crime with the real intention being limiting US ability to operate in space domain while allowing itself and Russia to attack satellites and other peaceful space vehicles through the use of anti-satellite weapons. A 2018 report titled ‘Worldwide Threat for the US Intelligence Community’ by Daniel R Coats, Director of US National Intelligence called out Russia and China’s hypocrisy saying they “could possess destructive weapons for use in a potential space conflict within the next few years and are currently pursuing anti-satellite weapons as a means to reduce US and allied military effectiveness and if a future conflict were to occur involving Russia or China, either country would justify attacks against US and allied satellites as necessary to offset any perceived US military advantage derived from military, civil, or commercial space systems. Russia and China continue to launch experimental satellites that conduct sophisticated on-orbit activities, at least some of which are intended to advance counter space capabilities”. Unsurprisingly, before any formal treaty comes into play in February 2019, US President Donald Trump on Feb. 19 signed Space Policy Directive 4 calling for the creation of a Space Force Department under the purview of the Secretary of the Air Force with the goal of eventually becoming converting the US sixth military branch. The Space Command will oversee and organize space operations, accelerate technical advances and find more effective ways to defend US assets in space including the vast constellations of satellites that American forces rely on for navigation, communications and surveillance. This step effectively checkmated any pacifist illusions that China and Russia may have held circa limiting US space warfare capabilities. With India now entering the club, the dynamics have been fundamentally altered. China will inevitably go rogue in space warfare and India is not currently equipped to tackle Chinese aggression in outer space hence the US stand on China-Russia suits Indian interests perfectly. China will not target US satellites first and will instead wage a proxy war with Japan and India. This also explains why India is pursuing a dialogue on space cooperation with Japan in March this year. With the ASAT test India gains tremendous soft power leverage apart from being in a position to propose its own treaty in becoming an active member and pursuing its national interests. While India conducted its first Anti-Satellite (ASAT) test on Wednesday, China is already developing counter-space capabilities with military units that are training with ASAT missiles and is likely to deploy a ground laser weapon to target space sensors by 2020. In Star Wars, Yoda said “Always in motion is the future”. Considering almost our entire life in the 21st century and the imminent Fourth Industrial Revolution depends on satellites, any disruption and disturbance here has the potential to completely bring our world to a standstill. From electricity grids, communication, banking, logistics, weather and climate forecasting to your daily commute; there is nothing that satellites are de-hyphenated from. Hence, as we move towards an uncertain world that is strange and surreal to most of us; it becomes even more important to have an early mover advantage to become a party to what comes next. In this respect, India’s ASAT test ensures that India will be able to understand the enemy to defeat it. Congratulations India, May the Force Be With You!